Living in the city makes me feel almost removed and oblivious to what is happening to the environment around me. Although urban areas are the cause of most pollutants, it’s ironic how out of touch we are to the effects we have on the environment. The smell of CO2 and other toxins such as sulfur from construction sites and the plentiful of single-use trash such as plastic bags and coffee cups have become so prevalent to our daily life, yet we don’t seem to correlate that our bad habits may cause harmful environment effects. Although I am guilty of not being mindful at times of my waste and actions, when I started taking environmental science in high school I noticed the drastic effects that my urban lifestyle may have on the environment. Although there are many scary predictions about our future such as the rising sea levels, global warming, decrease in population of fish and marine life, there is positive news in our progression to live a more sustainable lifestyle. On December 14th, 2018, a new law was passed in Boston that bans large grocery stores from giving plastic bags to their customers. Smaller retail stores will have until April 1, 2019 to comply. Customers will have the option of using their own reusable bag or they can purchase a paper bag at check-out for 5 cents. Although this change is very recent, I have noticed a drastic change in habits. For example, my parents have made it a habit to always bring a reusable bag to shopping centers. In addition, there is an increase of use in solar and wind energy. Recent studies show that since 2000, American wind power has grown 4,810%. With this trend, more sustainable energy sources might lead us to a future without the reliance of fossil fuels and other unsustainable energy. 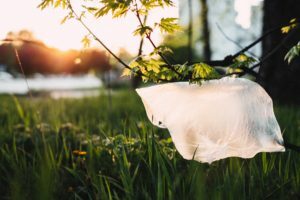 Hopefully as time progresses, there will be new legislation such as the Massachusetts’ abandonment of plastic bags that will lead us to a more eco-friendly lifestyle in the city. It is also important to be mindful of our actions and create habits to live a more environmentally friendly lifestyle like preventing food waste, reducing amount of single use items and/or plastic materials, and to follow tips such as reduce, reuse, and recycle. With these changes, we can see a brighter future for everyone and maintain the quality of life for future generations.